Could we use a pros/cons list to format discussion? Now I know meta is different from main sites, but there seems to be a big contrast between SE wanting to stick strictly to the Q&A format, and every single meta site out there. The discussion tag goes directly against the FAQ guidelines for main sites. No big problem is it, this is just meta? But what if it is a problem? Actually, everybody who adheres to the FAQ for the main site acknowledges part of the problem. Why wouldn't the same rules of the FAQ which have evolved so gracefully into its current form apply to a site which uses the exact same format? Because there is no other solution available? The Q&A format is not designed with discussions in mind. People have a tendency to stick to one opinion after they formed it. "People will dislike certain parts of a proposal, and then become vehemently against the entire thing, instead of trying to participate in resolving the issues they raise." Benjamin Franklin described a well-known decision-making process. To get over this, my Way is, to divide half a Sheet of Paper by a Line into two Columns, writing over the one Pro, and over the other Con. Then during three or four Days Consideration I put down under the different Heads short Hints of the different Motives that at different Times occur to me for or against the Measure. When I have thus got them all together in one View, I endeavour to estimate their respective Weights; and where I find two, one on each side, that seem equal, I strike them both out: If I find a Reason pro equal to some two Reasons con, I strike out the three. If I judge some two Reasons con equal to some three Reasons pro, I strike out the five; and thus proceeding I find at length where the Ballance lies; and if after a Day or two of farther Consideration nothing new that is of Importance occurs on either side, I come to a Determination accordingly. What would that look like on SE? Each pro or contra argument could follow a similar format as the current Q&A format. However, the question is replaced by an argumentation, which can be rated by others. Each post should contain just one argumentation. Answers make room to address issues with the argumentation, or express opinions about it. You are encouraged to participate in both sides of the discussion. Separate issues are discussed separately. My answer to this very question is an example of how I feel this discussion would be much more constructive in a pros/cons form (albeit with better formatting). I incorporated the entire comment thread underneath in a pros/cons format on which could ideally be voted separately. Well, this is an interesting idea, and I do like the format for certain discussions - if anyone wants to use this as a format for establishing consensus (perhaps via a Community Wiki post), they're welcome to try. See, this was a hack. The original "meta" was a tool called UserVoice - you can still find it here if you're interested in the historical data. The basic idea was, someone posts a short description of a bug they'd like fixed or feature they'd like to see, others vote on it if they also want it, and maybe leave comments if they've concerns or criticisms. It worked well enough when the site was very small (during the private beta), but as it grew larger its limitations became increasingly obvious. So the idea was to take another instance of the (then) Stack Overflow engine, and abuse the heck out of it to simulate UserVoice in a more flexible, scalable fashion. Things like tags, Markdown formatted text, editing, and image embedding made it a far nicer system for reporting bugs and proposing features. Mandatory tags (bug, feature-request, discussion, support) and moderator-only tags (status-*) were added to support categorizing and tracking the status on these things. Also, since it's still a Q&A site, it worked great for support (which UserVoice) was terrible at. We moved the community FAQ here from Stack Overflow and expanded it with actual questions folks were asking. But there are two aspects that are... Just plain hard to understand for those unfamiliar with the site because of how it was shoehorned into the SE format: discussion and voting. Discussion, with two-level threading, is handled by answers and comments. It's not perfect - if you end up going back and forth with someone for more than a few rounds, it falls apart badly. Fortunately, we have chat to serve the need for lengthy conversations. Still, that's not totally obvious to folks who haven't spent much time here - indeed, it briefly tripped up one of our own staff the other day. Support requests are again the closest to the sort of question that gets asked on, say, Stack Overflow, and voting tends to work the same way: common questions get up-voted, helpful answers get up-voted, lazy / unclear / unhelpful gets down-voted. Bug reports are similar to support requests, and in fact the two are often converted back and forth. Feature requests are the furthest from what you'll normally find asked. They're not really questions at all. Folks up-vote them if they like the proposed feature, and down-vote them if they don't. It's a pure popularity contest, with all the usual benefits to pandering. These may or may not even need answers, and when they do get answered all bets are off as to what they'll look like: agreement, disagreement, alternate implementation suggestions, unicorns... With voting being similarly confused. Discussion is anarchy. Maybe it's a feature-request where the details haven't quite been hashed out yet. Maybe it's a rant, or a straw-poll, or a short article or announcement. Voting is done according to whatever arbitrary criteria the voter feels appropriate. But here's the dirty little secret: voting isn't actually binding, not ever. The number of folks who'll ever see and vote on even the most popular of Meta posts is tiny compared to those using Stack Overflow every day. So while it's a good way to get a feel for how the community's opinion sits on an issue or suggestion, it will by its very nature be somewhat skewed. That doesn't make them worthless... But it does mean you need to be careful about attaching too much meaning to them. And it also makes creating a more rigorous voting system fairly pointless. The most valuable artifacts to come out of Meta aren't the votes. They're the discussions. And they're messy, and hard to find, and hard to follow, and frequently require someone like me to come in and summarize them for the folks who aren't here every day... But they are the actual history of the site, and the reflect far better than voting ever can how opinions are formed and changed over time. Again, be my guest to use the pro/con format to lay out arguments on any of these posts. I think in some instances it might actually work fairly well. But simply as a means to structure arguments, not as a framework for voting. By popular demand, an improved mockup of the idea. As content for the mockup I used this very discussion. It includes only several of the arguments I was able to identify. A list of all them can be found in my other answer. Hopefully you can 'imagine' them inside the currently presented mockup. You can't vote on an entire idea, but only on defined arguments. E.g. this proposal would never have gotten (+5/-13 votes), you would have to vote on either pro or contra arguments you agree with. Extensive discussion of a certain argument takes place inside a separate discussion, instead of how they are currently grouped in one long comment thread. The voting mechanism (as it also works now) doesn't result in a final answer. It's just meant to give an indication of the positives and negatives of a discussion and the votes act as a form of 'weight' to the separate arguments. I'm terribly disappointed in you meta ... :-( As a final reply I just want to leave you with this so hopefully you'll understand why I'm disappointed. It's About Questions Rather than Information. Any good discussion is dependent upon the questions. A good study will include open-ended questions that require more than a yes or no answer. if you are so anxious to provide an answer that you don't allow discussion, you will kill the effectiveness of the question. 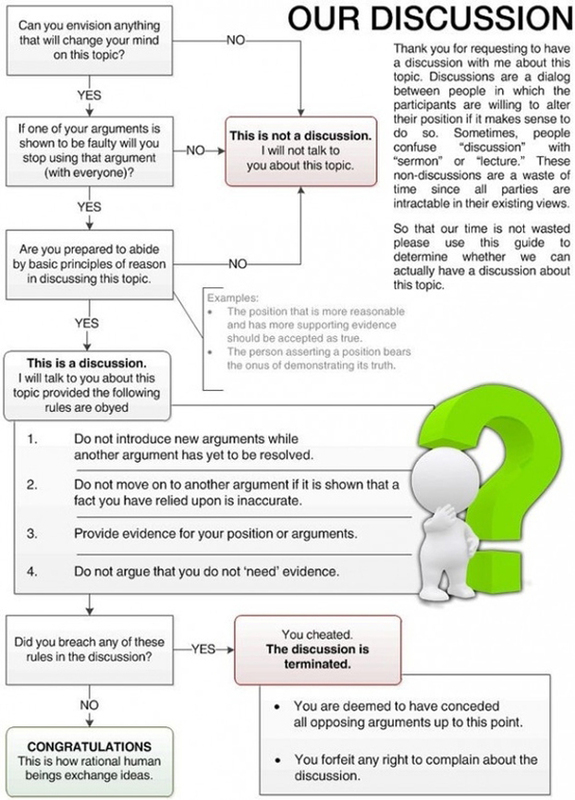 What makes a good discussion is when 2 sides are able to debate in a rational and reasonable discussion, providing evidence and theory, and both sides are able to be swayed to a certain point of middle understanding. What makes a fun discussion is when 2 sides are able to debate in a rational and reasonable discussion, providing evidence and theory, and each side thinks the other is out of their mind. ... but hey, carry on. I know how much more you like to down vote this answer. To demonstrate why this would be more constructive than using the current 'Q&A' format, I'll use this very discussion as an example of how a pros/cons format could have been used to construct this discussion instead. Discussion: Could we use a pros/cons list to format discussions? You can't up or down vote on this topic, as contrasted with the current system where you up or down vote on the entire proposal. Look at this very mockup, I see only contra points get feedback, while pro points seems untouched. Would this be a hole? Not the answer you're looking for? Browse other questions tagged discussion bias . 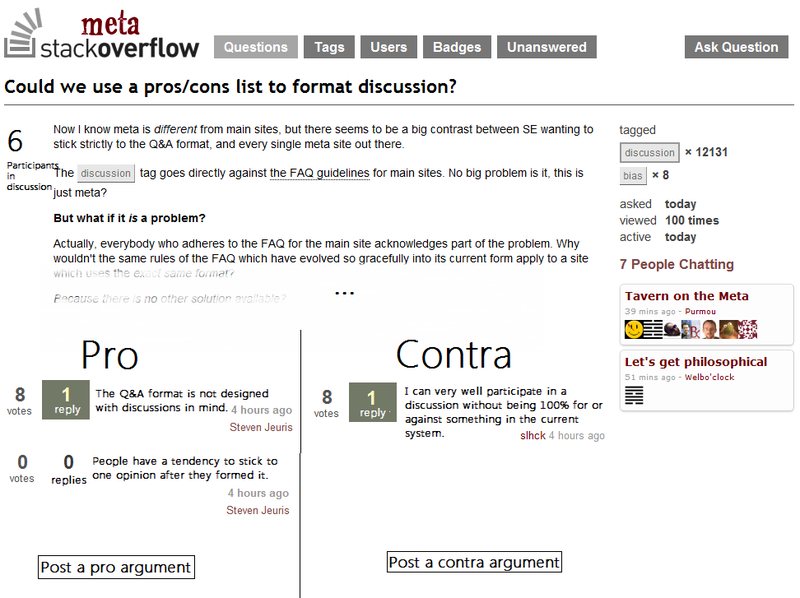 How can Meta be made more conducive to discussions? Would it be better to have voting counts open on meta? What criteria should be used to vote down meta questions? Where can I discuss Meta? Pros/Cons lists comparing two methods/technologies/etc. Constructive or not?